Spanish Christian theologian; born in the first half of the thirteenth century at Subirats in Catalonia; died after 1284. In 1250 he was selected by the provincial chapter, sitting in Toledo, to study Oriental languages at a Dominican school which had been founded for the express purpose of preparing its pupils to engage in polemics against Jews and Moors. Subsequently he lived for a long time in a monastery at Barcelona. In March, 1264, he was commissioned, with the Bishop of Barcelona, Raymund de Peñaforte, and two other Dominicans, Arnoldus de Sagarra and Petrus Janua, to examine the Hebrew manuscripts and books which the Jews, by order of the king, were to submit to them, and to cancel passages deemed offensive to the Christian religion. 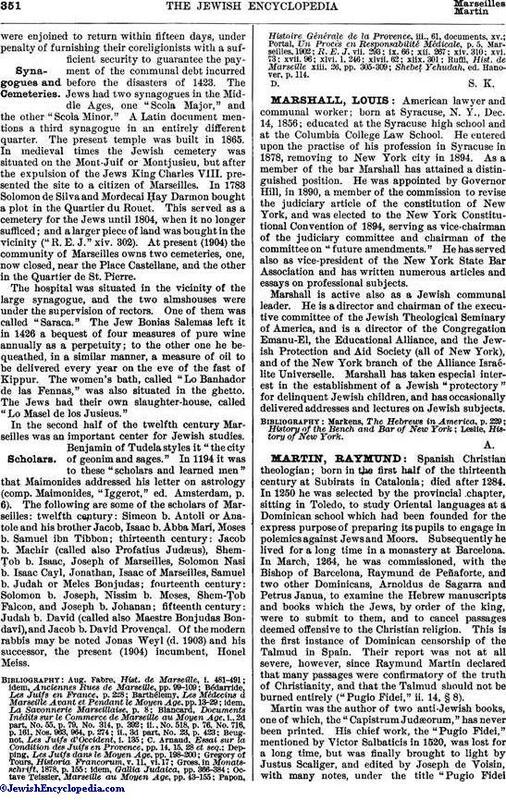 This is the first instance of Dominican censorship of the Talmud in Spain. Their report was not at all severe, however, since Raymund Martin declared that many passages were confirmatory of the truth of Christianity, and that the Talmud should not be burned entirely ("Pugio Fidei," ii. 14, § 8). 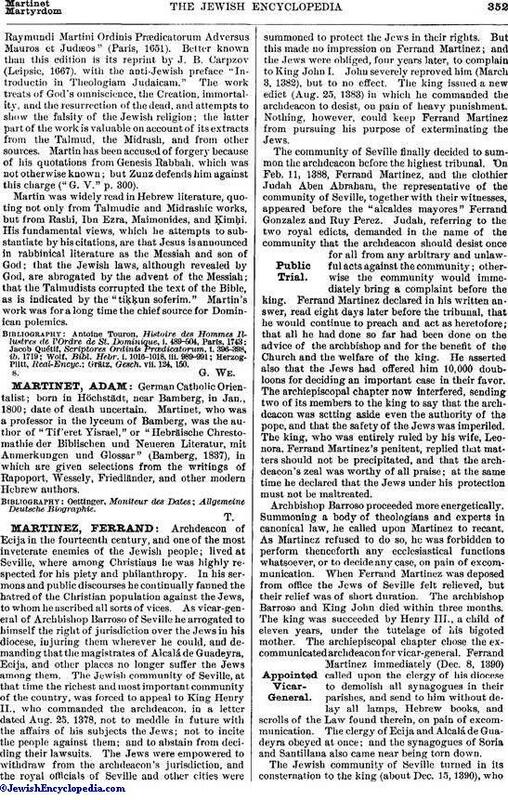 Martin was the author of two anti-Jewish books, one of which, the "Capistrum Judæorum," has never been printed. His chief work, the "Pugio Fidei," mentioned by Victor Salbaticis in 1520, was lost for a long time, but was finally brought to light by Justus Scaliger, and edited by Joseph de Voisin, with many notes, under the title "Pugio FideiRaymundi Martini Ordinis Prædicatorum Adversus Mauros et Judæos" (Paris, 1651). Better known than this edition is its reprint by J. B. Carpzov (Leipsic, 1667), with the anti-Jewish preface "Introductio in Theologiam Judaicam." The work treats of God's omniscience, the Creation, immortality, and the resurrection of the dead, and attempts to show the falsity of the Jewish religion; the latter part of the work is valuable on account of its extracts from the Talmud, the Midrash, and from other sources. Martin has been accused of forgery because of his quotations from Genesis Rabbah, which was not otherwise known; but Zunz defends him against this charge ("G. V." p. 300). Martin was widely read in Hebrew literature, quoting not only from Talmudic and Midrashic works, but from Rashi, Ibn Ezra, Maimonides, and Ḳimḥi. His fundamental views, which he attempts to substantiate by his citations, are that Jesus is announced in rabbinical literature as the Messiah and son of God; that the Jewish laws, although revealed by God, are abrogated by the advent of the Messiah; that the Talmudists corrupted the text of the Bible, as is indicated by the "tiḳḳun soferim." Martin's work was for a long time the chief source for Dominican polemics. Grätz, Gesch. vii. 124, 150.